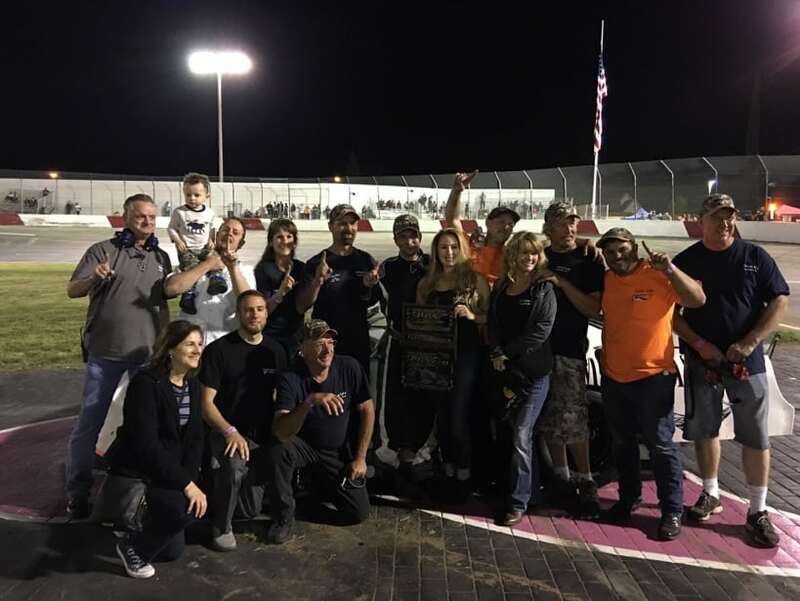 The Pacific Challenge Series Late Model race was a thrilling finale of the 11th Annual October Classic at the All American Raceway at Placer County Fairgrounds, dubbed ‘The Grounds’. After seven Northern California races since March 31st, Jason Romero, from Cameron Park, California, took top points to win the series. Jason ‘Rowdy’ Romero, driving the Folsom Lake Asphalt car, number 8, had several obstacles to take this title. Starting in the seventh position, Romero maneuvered expertly to the third position by lap thirteen of the 100-lap race. While pushing for a second position, he bumped the second position car, relegating his car to the back of the pack. Romero worked his way up to third position again by a restart after lap 72, and artfully edged up to second by lap 90. Challenging for the lead, he managed to finish 1.377 seconds behind the ultimate race winner, Cole Moore of Granite Bay, driving car number 20 sponsored by JM Environmental/Berco. The thrilling finale was preceded by two other racing classes, the NASCAR K&N Pro Series, slated for 200 laps, won by Cole Rouse in car number 99, and the North State Modifieds Championship, slated for 60 laps but finishing the time limit at lap 19 after many yellow caution flags and a lengthy red flag stoppage, was won by Kris Price in car number 51x. Contrary to many statistic-quoting pundits, this racing crowd was big. The stands were full, and there were plenty of activities away from the grandstands, like a huge beer garden with barbecue and a classic car show. There was live music, and several stands with food and beverages and souvenirs of the sport. The grandstands were partially covered to protect patrons from the late afternoon sun. Several huge TV screens provided a view of the whole racetrack, so no matter where one was seated, you didn’t miss a bit of the exciting action. Commentary kept even the new fan, like this writer, informed of incidents, race positions, and back stories. The ‘score board’ showed the places for the top competitors, so you didn’t miss a beat with the cars whizzing by. Wide walkways made it easy to get out for a beverage or visit the clean ‘facilities’. There were many families, some three-generations deep, with sound-protecting headphones for the younger ears. The kids were completely excited and danced and cheered throughout the races. Security was abundant and highly visible, walking around and on bicycles – Roseville Police Officers and Cadets. As you know, Folsom Lake Asphalt has been building, repairing, maintaining, fixing and keeping your asphalt prime for nearly 40 years, so it’s no wonder that we have affection for the track. We sponsor our own race car. Come join us at the track sometime.